Those of you who have been in for an appointment on a Thursday over the past month have met my father, Mark. He's officially retiring at the end of June, and he's going to continue helping me out in my office one day a week. My Dad is a really great writer, and he's the guest author for this blog post. Enjoy! Spring brings not only warmer weather but also the beginning of a glorious bounty of great things to eat from the garden. Abundant during these times is summer squash, typically considered to be the triumvirate of zucchini, yellow crookneck and straightneck, and scallop, or pattypan. For some, summer squash does not inspire, instead conjuring up memories of a limpid vegetable (it’s actually a fruit) sitting in a pool of water in the plate, or southern style drowning in butter and leaving not much else to taste. Additionally, there’s often little consideration of squash’s nutritional value in the way that carrots are prized for beta-carotene or dark leafy greens for their bonanza of vitamins and minerals. So the next time you think squash, appreciate what you’re getting and know how to prepare it in a way that satisfies your senses. There’s a lot of healthy goodness packed into summer squash. It’s a great source of conventional antioxidant nutrients like Vitamin C and Vitamin A, as well as the carotenoids lutein and zeaxanthin that are especially helpful in protection of the eye, including against age-related macular degeneration and cataracts. Benefits also abound for blood sugar regulation which requires the ample presence of B-complex vitamins, many of which are found in valuable amounts in summer squash. And the dietary fiber in summer squash includes pectin polysaccharides that an increasing number of animal studies have shown keep insulin metabolism and blood sugar levels in balance, and protect against the onset of type 2 diabetes. Some of these same nutrients also have anti-inflammatory properties and so provide a useful double punch in potentially combating cancer and other chronic diseases. Summer squash is delicious raw with your favorite dip, or grated on a salad or a sandwich. Steamed with other vegetables, sautéed in a bit of olive oil, oven roasted, or grilled are simple ways to enjoy its natural flavor. If you’re more adventurous, ratatouille, with its mélange of onions, bell peppers, eggplant, and tomatoes, is a tasty choice. And newspapers, cookbooks, and the internet are chock full of all kinds of recipes, any number of which are sure to please. 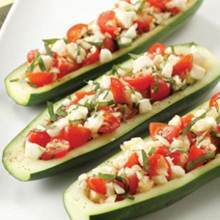 Here’s a fresh, colorful summer side dish of zucchini stuffed with tomatoes, mozzarella, and basil.